Managing the psychological and physiological effects of stress presents a global challenge for healthcare [1, 2]. The negative impact of chronic stress on brain health and cognition has been well defined [3–5]. Unmanaged stress is also known to mediate the breakdown of other biological functions, such as those associated with the immune [6–8] and cardiovascular systems [9, 10]. While there are many effective ways to manage stress and treat stress-related disorders , each approach suffers from some critical limitation for effectively confronting the negative health consequences of stress. Pharmacological approaches to managing stress, for example with benzodiazepines, suffer from drawbacks like causing drowsiness, blunting general affect, impairing attention and possibly leading to addiction . Relaxation-based approaches such as meditation, focused breathing, or mindfulness have been shown to be beneficial, but require time investments and training that often prohibit high compliance rates . Exercise is another effective approach to manage stress and has additional health benefits, but again due to the time commitment required and influence of other motivational factors compliance is often low . To address the above referenced limitations, we hypothesized neuromodulation-based approaches to managing stress might provide a viable alternative. We sought to develop a method for modulating psychophysiological arousal and stress responses by providing electrical signaling waveforms through afferent pathways of cranial nerves to neuromodulatory nuclei in the brainstem. During signal transmission to cortex, incoming sensory signals carried by the trigeminal and facial nerves simultaneously undergo local processing by a series of highly inter-connected structures including the reticular formation (RF) of the reticular activating system (RAS) located in the pons (Figure 1). These brain stem circuits are a first station of information integration in the brain that support higher consciousness by filtering, integrating, and processing incoming sensory information . Here cranial and spinal nerve activity modulates the nucleus of the solitary tract (NTS), locus coeruleus (LC) and other nuclei responsible for the bottom-up regulation of cortical gain, psychophysiological arousal, and neurobiological responses to environmental stimuli and stressors (Figure 1) [16–22]. More specifically trigeminal afferent activity can modulate noradrenergic neurons via direct projections from the trigeminal sensory nucleus to the LC . Through these bottom-up pathways, the LC and noradrenergic signaling modulates human behavior, sleep/wake/arousal cycles, and higher cortical functions including attention and cognition [16–22]. Exemplifying functional modulation of this circuitry, trigeminal nerve modulation has been shown to be moderately effective for treating psychiatric disorders like depression  and neurological conditions like epilepsy [24, 25]. 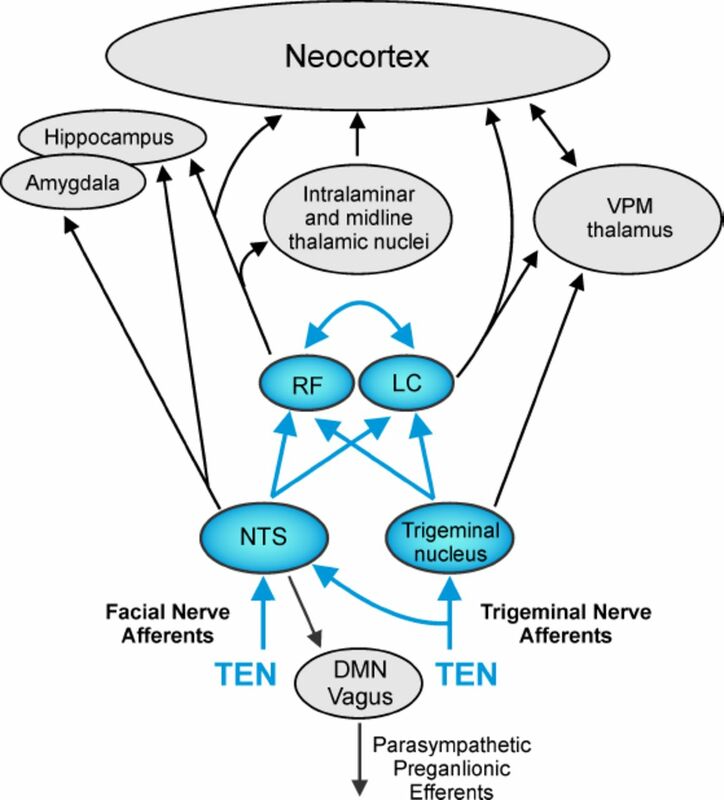 The circuit diagram illustrates trigeminal and facial nerve afferents impinging on the nucleus of the solitary tract (NTS) and trigeminal nuclei in the brainstem. There are direct projections from the NTS and trigeminal nucleus to the noradrenergic locus coeruleus (LC) and the reticular formation (RF). The major pathways and circuitry highlighted in blue was targeted using high frequency (7 – 11 kHz), pulsed modulated transdermal electrical neurosignaling (TEN) waveforms delivered through trigeminal, facial, and C2/C3 cervical spinal afferent fibers projecting to the pons of the brain. Trigeminal and facial nerve afferents (sensory and proprioceptive) can modulate the activity of the LC, NTS, and RF to affect psychophysiolgical arousal, the activity of the sympathoadrenal medullary (SAM) axis, biochemical stress responses, and parasympathetic preganglionic fibers projecting from the dorsal motor nucleus (DMN) of the vagus. The bottom-up neurosignaling pathways illustrated serve mechanisms for the regulation of cortical gain control and performance optimization by influencing a broad variety of neurophysiological and cognitive functions, as well as primary sympathetic responses to environmental stress [46, 78]. Given the growing interest in electrical and electromagnetic neuromodulation methods, we have spent the past few years developing wearable neurosignaling systems, devices, and approaches that enable the safe and comfortable modulation of peripheral and central neural pathways using pulsed electrical waveforms. Norepinephrine (NE) mobilized from the LC plays an integral role in mediating the brain’s major sympathetic responses to environmental stressors, making it a promising target for mitigating stress responses. In the present paper, we tested the hypothesis that neuromodulation employing a high-frequency, pulse-modulated transdermal electrical neurosignaling (TEN) waveform targeting afferents (sensory and proprioceptive) of the right trigeminal nerve (V1/V2 distributions), temporal branch of the facial nerve, and cervical spinal nerves (C2/C3) can evoke relaxation while altering the psychophysiological and biochemical responses to experimentally-induced acute stress. Our observations suggest this neurosignaling approach may be useful for alleviating the subjective, physiological, and biochemical responses to acute stress by exerting an effect on endogenous noradrenergic signaling. All experimental procedures were conducted on human volunteers using protocols approved by an independent Institutional Review Board (Solutions IRB, Little Rock, AR). All subjects provided written informed consent prior to experimentation. In Experiment 1, designed to study the influence of TEN on self-reported relaxation, the sample consisted of 82 healthy right-handed subjects (34 male, 48 female) between the ages of 18 and 50 (mean age = 24.07 ± 7.07 years) that were recruited from the greater Boston, MA area. Forty three percent of participants were Caucasian, 35% were Asian, 12% were African-American, and 6% were Hispanic. These participants were fairly educated: 60% completed some college, 22% had a college degree, and 16% completed some post-graduate work or had a post-graduate degree. Exclusion criteria were as follows: neurological or psychiatric disorder, cranial or facial metal plate or screw implants, severe face or head trauma, recent concussion or brain injury, recent hospitalized for surgery/illness, high blood pressure, heart disease, diabetes, acute eczema on the scalp, and uncorrectable vision or hearing. In Experiment 2, designed to study the influence of TEN on psychophysiological arousal and the mobilization salivary biochemicals in response to acute stress, 20 male subjects were yoked from the previous sample. We used males to avoid the introduction of confounds related to hormonal variance across menstrual cycles on stress biochemical profiles. The subjects were between the ages 19 to 27 (mean age = 22.3 ± 2.2 years). Fifty percent of the subjects were Asian, 35% were Caucasian, 10% were African American and 5% were Hispanic. Forty percent of participants had completed some college, 40% had a college degree and 15% had completed some post-graduate work. Fifty percent were employed and of those who indicated that they were unemployed 50% were students. Prior to this study, we spent two years developing and investigating a variety of electrical neuromodulation waveforms and approaches. The transdermal electrical neuromodulation (TEN) waveform developed for use in this study was a pulse-modulated (7 – 11 kHz), biphasic electrical current producing average amplitudes of 5 – 7 mA for 14 min. The sham waveform was an active stimulation control as described above, but pulsed at a variable frequency of 1 - 2 kHz (< 4 mA average for 14 min) to mimic skin sensations similar to those experienced throughout the real TEN stimulation protocol (Table 2). Subjects were not able to distinguish any differences between the sensations elicited by the real TEN or sham waveforms. During both the real TEN and sham stimulus protocols, subjects were instructed to adjust the current output of a wearable TEN device (Thync, Inc., Los Gatos, CA) using an iPod touch connected to the device over a Bluetooth low energy network such that it was comfortable. TEN and sham waveforms were delivered to the right temple (10/20 site F8) and base of the neck (5 cm below the inion) using custom-designed electrodes comprising a hydrogel material and a conductive Ag/AgCl film secured to the wearable TEN device. The anterior electrode positioned over F8 was a 4.9 cm2 oval having a major axis of 2.75 cm and a minor axis of 2.25 cm while the posterior electrode was a 12.5 cm2 rectangle with a length of 5 cm and a height of 2.5 cm. The average current density was < 2 mA/cm2 at all times to keep in accordance with general safety practices to prevent any damage to the skin. Subjects were assigned to experimental conditions using a randomization method or a counterbalancing approach. Subjects were always kept blind to all experimental conditions. As illustrated in Figure 2A, 82 participants blinded to condition received a 14 min sham treatment and a 14 min TEN treatment. In between each treatment session subjects had a 15 min rest period. Immediately following each treatment subjects were asked to report their level of perceived relaxation on a 11-point scale, where 0 = not relaxed and 10 = extremely relaxed. A, The illustration depicts the experimental approach used to evaluate the influence of TEN on self-reported relaxation. In a within-subjects design, 82 subjects received both a 14 min sham treatment and a 14 min TEN treatment separated by a 15 min rest period. The order of sham and TEN treatments were counterbalanced across subjects. At the end of each treatment, subjects self-reported their perceived level of relaxation on a 10-point scale. B, The illustration depicts the experimental approach used to evaluate the influence of TEN on psychophysiological and biochemical responses to stress. In a between-subjects design, 20 subjects received either a 14 min sham treatment (N = 10) or a 14 min TEN treatment (N = 10) beginning 20 min after an acclimatization period and immediately before the onset of a stress trial. The composition of the stress trial is expanded for clarity (bottom). To assay stress biomarkers, saliva samples were acquired before the stress trial, 10 min after the stress trial, and 30 min after the stress trial as indicated. We recorded heart rate and galvanic skin resistance during the stress trial for measurement of psychophysiological arousal. For additional details, see Materials and Methods. In Experiment 2, we implemented an acute stress induction paradigm to study the effects of TEN on physiological and biochemical stress responses. Subjects received either TEN or sham treatment in a between-subjects design (N = 10 subjects per group). All participants were tested between the hours of 13:00 and 16:00 to limit variability introduced by circadian fluctuations in salivary analytes (see Salivary collection and stress biomarker assays below). Following informed consent, subjects were allowed to acclimate for 20 min before providing a baseline saliva sample. After providing the initial saliva sample, subjects were connected to a wearable TEN device as described above, a peripheral nerve stimulator (MiniStim MS-IVA, Life-Tech, Inc., Dallas, TX) was positioned over the median nerve of the right wrist, and a Shimmer3 (Shimmer, Dublin, Ireland) optical heart rate (HR) monitor and galvanic skin resistance (GSR) sensor was placed on the index, middle, and ring fingers of the opposite hand. The timing, presentation of stimuli, and acquisition of HR and GSR data was accomplished using Attention Tool (iMotions, Inc., Cambridge, MA). The stress trial (Figure 2B) commenced at the onset of TEN or sham treatment. There was a 6 min pre-trial period to give the TEN or sham treatment time to begin exerting an effect before the induction of acute stress began. The stress trial comprised a 6 min classical fear-conditioning paradigm immediately followed by a 6 min time-constrained cognitive battery. Immediately following the time constrained cognitive tests the stress trial concluded with a 3 min neutral video of a nature scene. Both the classical fear-conditioning paradigm and the time-constrained series of cognitive tests are known to induce acute stress and increase sympathetic activity [26–29]. Participants were instructed that when the computer monitor they were seated in front of began to flash still images that they would be given an electrical shock every time an image of lightning appeared. This induced an anticipatory increase in acute stress as reflected by instantaneous changes in GSR (Figure 5A). During the fear-conditioning component of the stress trial participants were randomly presented with 40 still images of nature scenes for 6 seconds each: 10 images of lightning paired with electrical shock (0.5 sec, 4 - 6.5 mA) and 30 neutral nature scenes. The second component of the stress trial included a time-constrained series of three cognitive tests (2 min each) including a Flanker test, n-back working-memory test, and a Stroop task. The Flanker task is a selective attention task in which participants indicate the direction of a target stimulus that is flanked by stimuli that are oriented in the same direction (congruent), in the opposite direction (incongruent), or a neutral direction as the response target. The n-back, which assesses working memory, has participants view a sequence of stimuli and indicate when the current stimulus matches the stimuli from n steps earlier in the sequence. In this case, subjects were instructed to get to 2 back as quickly and accurately as possible. The Stroop task tests sematic memory by having participants indicate the color of the ink in which a color word is written as fast as possible. Trials can be congruent, the text color and the word refer to the same color, or incongruent, the ink color and the word refer to different colors, which can lead to frustration and itself induce acute stress [28, 29]. Reaction times and accuracy were measured for all tests and analyzed off-line in subsequent analyses. Following the stress trial, there was a 30 min. recovery period during which subjects reported the presence, duration (in minutes) and severity (0 to 8 scale) of skin redness or irritation, headache, dizziness, nausea, and vision or hearing changes and two additional saliva samples were collected as described below. We acquired cardiac activity and electrodermal activity during the stress trial using a Shimmer3 optical heart rate monitor integrated with a GSR sensor. Raw electrocardiogram data were collected using Attention Tool before being processed offline using Kubios HRV (University of Eastern Finland, Kuopio, Finland). From these data we quantified the average HR, R-R interval, standard deviation of the normal-to-normal heartbeat (SDNN), power in the low-frequency (0.04 – 0.15 Hz) and high-frequency (0.15 – 0.4 Hz) bands of the HRV spectra, and the LF/HF ratio in response to TEN and sham treatments during the stress trial. All GSR data were acquired using Attention Tool and stored offline for analysis using Igor Pro (Wavemetrics, Inc., Portland, OR). All GSR data were baseline-normalized (30 sec) for each subject to facilitate comparisons across subjects and treatment conditions. We quantified the peak-to-peak changes for GSR occurring at the onset of the fear-conditioning component of the stress trial (ΔGSRfear; Figure 5A) and the average peak-to-peak change in response to the delivery of the 10 unconditioned stimuli or electrical shocks (ΔGSRshock; Figure 5A) for each subject. Prior to arrival, participants were instructed to not brush their teeth within 45 minutes, eat within one hour, consume caffeine or alcohol within 12 hours or have dental work performed within 24 hours of their scheduled appointment. After providing informed consent, participants rinsed their mouths in preparation for contributing a saliva assay and were then seated in a quiet room during which they self-reported basic demographic information. After 20 minutes, participants provided a baseline saliva sample via the passive drool method. As per manufacturer’s instructions (SalivaBio, Inc., State College, PA), saliva is pooled at the front of the mouth and eased through a tube, centered on the lips, directly into a cryovial, and immediately stored at −20° C. The same collection procedure was used to collect additional saliva samples 10 min and 30 min following the end of the stress trial. Saliva samples were coded and sent to Salimetrics, LLC (State College, PA) where ELISA methods were employed to assess α-amylase (Salimetrics 1–1902) and cortisol levels (Salimetrics 3002) in a blinded manner. The protein α-amylase is widely recognized as a biochemical marker of sympathetic nervous system activity and sympathoadrenal medullary (SAM) axis activation. More specifically, salivary levels of α-amylase directly correlate with plasma norepinephrine (NE) concentrations following the induction of acute stress including when electrical shock is used as a stressor [30–36]. Cortisol is a prototypical stress hormone reflective of hypothalamus pituitary adrenal (HPA) axis activation, which has slower onset and longer lasting effects compared to SAM axis activation. Unless otherwise indicated all statistical analyses were conducted using independent t-tests with IBM SPSS Statistics Software (IBM Corporation, Armonk, NY). The self-report data were analyzed using a paired t-test with SPSS. The cognitive data were analyzed using a series of one-way ANOVA’s with SPSS. Thresholds for statistical significance were set at p < 0.05. All data reported and shown are mean ± SD. We first conducted a within-subjects experiment designed to assess the influence of TEN on self-reported relaxation. Briefly, all subjects (N = 82) were blinded to the experimental conditions and received both a sham and TEN treatment (14 min each) with a 15 min rest period between sessions (Figure 2A). Following each treatment, subjects were asked to rate how relaxed they felt. This information was recorded on an 11-point scale, where 0 = not relaxed and 10 = extremely relaxed. A paired sample t-test revealed that subjects were significantly more relaxed following TEN compared to sham (sham = 2.82 ± 2.03, TEN = 5.15 ± 2.14; p = 2.63 × 10−11; Figure 3A). The effects of TEN treatment were prominent as 77 of 82 subjects (94%) reported it induced greater relaxation than sham treatment (Figure 3B). None of the subjects reported either the TEN or sham stimulus as being distressing, uncomfortable, or irritating. A, The histograms illustrate the frequency distribution of self-reported relaxation scores recorded by subjects (N = 82) after receiving sham (red) and TEN (blue) treatment. The histograms have been fit with a Lorentz function to highlight peak and distribution of scores. B, The histograms illustrate the frequency distribution of difference scores (TEN – sham) obtained on the relaxation self-reports from each subject. 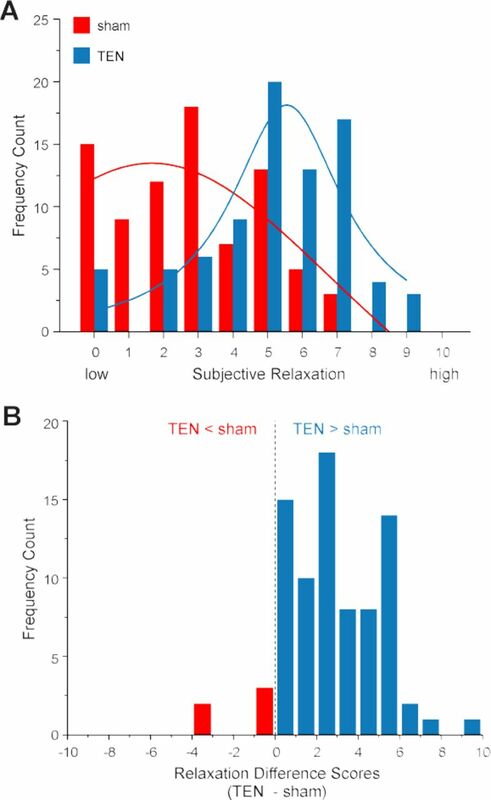 A positive value indicates a subject’s relaxation score for TEN > sham while a negative value indicates a relaxation score for TEN < sham. To determine the effect of TEN on physiological stress responses, we tested for group differences (TEN versus sham, N = 10 each) in heart rate variability (HRV), a common biometric of psychophysiological arousal reflecting autonomic function including parasympathetic and sympathetic nervous system activity [37, 38]. We found there were no significant differences in average heart rate (HR) between the sham (HR = 67.01 ± 8.47 bpm) and TEN (HR = 69.18 ± 7.34 bpm) treatment groups during the stress trial (p = 0.55; Figure 4A). Likewise the R-R intervals were not significantly different between the treatment groups during the stress paradigm (sham R-R interval = 922.07 ± 124.88 msec, TEN R-R interval = 885.21 ± 94.34 msec; p = 0.466; Figure 4B). Analysis of HRV revealed subjects treated with TEN had a significant 34% reduction in SDNN compared to subjects treated with sham during the stress trial (sham SDNN = 105.45 ± 28.91 msec, TEN SDNN = 78.48 ± 16.60 msec; p = 0.02; Figure 4C). Additionally, subjects in the TEN treatment group had a significant 88% reduction in the power of the LF (0.04 – 0.15 Hz) HRV component of the HRV spectrum compared to subjects treated with sham during the stress trial (sham LF power = 2946.80 ± 1352.12 msec2, TEN LF power = 1567.40 ± 827.24 msec2; p = 0.01; Figure 4D). A similar trend was observed for the power of the HF component (0.15 – 0.4 Hz) of the HRV spectrum. Subjects treated with TEN had 71% less power in the HF component of the HRV spectrum compared to sham-treated subjects during the stress trial. This difference was marginal however and failed to reach a significant threshold (sham HF power = 2367.70 ± 1534.22 msec2, TEN HF power = 1381.50 ± 804.42 msec2; p = 0.09; Figure 4E). There were no significant differences in the LF/HF ratios across treatment groups (sham LF/HF = 1.42 ± 0.43, TEN LF/HF = 1.20 ± 0.50; p = 0.30; Figure 4F). The histograms illustrate the average HR (A), R-R interval (B), SDNN (C), LF power (D), HF power (E), and LF/HF (F) HRV responses mediated by sham and TEN treatments in response to the induction of acute stress. An asterisk indicates a significant difference with p < 0.05. We next examined how TEN affected changes in electrodermal activity or galvanic skin responses (GSR), which is responsive stress and under the control of sympathetic activity (Figure 5A) . Compared to sham we observed that TEN treatment (N = 10 subjects per group) produced a significant 32% suppression in anticipatory GSR occurring in response to the onset of the fear-conditioning component of the stress trial prior to the delivery of the first unconditioned stimulus (ΔGSRfear; sham ΔGSRfear = 0.54 ± 0.11, TEN ΔGSRfear = 0.37 ± 0.14; p = 0.007; Figure 5B). Similarly, we observed the average GSR occurring in response to delivery of the unconditioned stimuli (10 electrical shocks per trial) was significantly suppressed by 53% in response to TEN treatment compared to sham treatment (sham ΔGSRshock = 0.19 ± 0.04, TEN ΔGSRshock = 0.09 ± 0.06; p = 0.001; Figure 5B). These data indicate TEN treatment significantly suppressed sympathetic activity in response to the delivery of unconditioned fear stimuli (electrical shocks) used as an environmental stressor. A, The line plot illustrates a typical GSR profile obtained from a subject treated with TEN during the stress trial. All subjects exhibited the same type of response where there was a sharp anticipatory rise in GSR at the onset of the fear-conditioning component of the stress trial before the delivery of the first unconditioned stimulus (ΔGSRfear) and smaller transient GSR increases in response to the delivery of each electrical shock (ΔGSRshock) or unconditioned stimulus as illustrated. For clarity, the area marked by the dashed rectangular box is shown at a higher temporal and amplitude scale in the inset with the delivery of shocks indicated in blue. B, The histograms illustrate the average GSR changes for the TEN and sham treatment groups obtained during the fear-conditioning phase of the stress trial. An asterisk indicates a significant difference with p < 0.05. The protein enzyme α-amylase is widely recognized as a biochemical marker of sympathetic nervous system activity and sympathoadrenal medullary (SAM) axis activation [30–32, 36]. More specifically, salivary levels of α-amylase directly correlate with plasma norepinephrine (NE) concentrations following the induction of acute stress including when electrical shock is used as a stressor [30–36]. To assess the impact of TEN on sympathetic activity and SAM axis activation, we examined fluctuations in salivary α-amylase (sAA) levels before (baseline) and after the acute induction of stress (Figure 2B). We found the mean baseline levels of sAA were not significantly different between the sham (N = 8 subject samples) and TEN (N = 10 subject samples) treatment groups (sham = 102.45 ± 39.60 U/mL, TEN = 85.57 ± 41.03 U/mL; p = 0.39; Figure 6A). Ten minutes after the stress trial, the average levels of sAA for the sham group had increased 0.6% from their baseline values while in the TEN-treatment group they had dropped 24%. However, this difference only produced a marginal effect when comparing the levels of sAA between treatment groups (sham = 103.13 ± 46.43 U/mL, TEN = 68.93 ± 27.26; p = 0.07; Figure 6A). Thirty minutes after the stress trial, the average sAA levels for the sham group had increased 6.5% from their baseline values while the sAA levels for subjects treated with TEN had dropped 19.8% from baseline values resulting in a significant difference between treatment groups (sham = 110.30 ± 35.11 U/mL, TEN = 68.62 ± 28.93 U/mL; p = 0.01; Figure 6A). The histograms illustrate the average levels of α-amylase (A) and cortisol concentration (B) in saliva samples taken before (baseline), 10 min, and 30 min after the stress trial for sham and TEN treatment groups. An asterisk indicates a significant difference with p < 0.05. Cortisol levels did not significantly differ between sham and TEN treatments at any of the time points tested. At baseline the salivary cortisol concentration for sham was 0.26 ± 0.13 µg/dL and 0.24 ± 0.09 µg/dL for the TEN-treatment group (p = 0.75; Figure 6B). Ten minutes after the stress paradigm the salivary cortisol concentration for sham was 0.23 ± 0.15 µg/dL and 0.19 ± 0.11 µg/dL for the TEN-treatment group (p = 0.51; Figure 6B). Thirty minutes after the stress paradigm the salivary cortisol concentration for sham was 0.18 ± 0.09 µg/dL and 0.16 ± 0.06 µg/dL for the TEN-treatment group (p = 0.67; Figure 6B). Subjects took three consecutive, time-constrained cognitive tests (Flanker test, n-back, and Stroop task; 2 min each) evaluating attention and working memory to evaluate the effects of TEN on executive processing during stress induction. A series of one-way ANOVAs revealed there were no significant differences between sham and TEN treated subjects in error rates or reaction times for congruent and incongruent tasks (Table 1). These data indicate that while TEN can suppress sympathetic activity in response to acute stress, it does so without impeding general/executive cognitive performance. We assessed differences in the incidence (frequency), duration (in minutes), and severity (eight point scale) of the most common side effects associated with electrical neurostimulation using subject self-reports. TEN and sham groups had similar incidence rates of side effects with similar severity and durations (Table 2). Notably, there were no reports of headaches, nausea, or hearing changes. Further, no severe adverse events were reported. Our observations demonstrate the TEN protocol we developed and implemented in this study increased self-reported relaxation and attenuated psychophysiological and biochemical responses to acute stress. The brain and body’s response to stress is complex and not easy to unravel. As discussed below however, an inspection of anatomical circuitry and comparison to well-established neurosignaling pathways indicates the TEN approach employed acted upon noradrenergic systems to modulate stress responses via bottom-up mechanisms. There are several mechanisms by which TEN could have suppressed stress responses. TEN could have inhibited and/or activated cranial nerve and cervical spinal nerve afferents. Perhaps the most parsimonious explanation is that TEN, delivered in pulsed currents ranging from the 7 −11 kHz suppressed stress responses by inhibiting trigeminal and cervical spinal afferent activity thereby dampening basal sympathetic tone. Such a mechanism would be consistent with other observations using high-frequency electrical currents to modulate neuronal activity. For example, high-frequency (10 kHz) spinal cord stimulation has been found to be effective at blocking low back and leg pain without producing paresthesia . Such an outcome may be due to the fact that high-frequency electrical stimulation (2 - 20 kHz) has been shown capable of producing rapid and reversible blockade of neuromuscular activity . These types of nerve-block mechanisms are attractive to explain the influence of TEN on stress responses primarily due to their simplicity. However skin sensations associated with TEN indicate afferent pathways remained intact suggesting nerve activation mediated the attenuation of stress responses observed. In fact, evidence dating back to the dawn of modern electrophysiology has demonstrated high-frequency currents effectively stimulate peripheral nerve through a variety of mechanisms including by avoiding a refractory period . When synthesizing the TEN waveforms used in this study, we chose high-frequency pulsing parameters to maximize safety and improve comfort by minimizing efferent stimulation of neuromuscular fibers. We propose the high-frequency TEN currents transmitted via afferent fibers modulated the activity of the locus coeruleus (LC) and norepinephrine (NE) signaling to attenuate stress responses as discussed below. We originally hypothesized that TEN waveforms targeted to the ophthalmic (V1) and maxillary (V2) divisions of the trigeminal nerve and the temporal branch of the facial nerve innervating the vicinity of the right temple (F8), as well as C2/C3 cervical spinal afferents innervating the neck could attenuate acute stress responses. This hypothesis was derived from the fact that trigeminal and facial nerve afferents give rise to synaptic circuits in the pons that provide inputs to the nucleus of the solitary tract (NTS), reticular formation (RF), and noradrenergic LC as illustrated in Figure 1. The principal sensory nucleus of the trigeminal nerve provides direct projections to the LC and establishes at least one direct pathway by which trigeminal afferents can modulate noradrenergic activity (Figure 1) . In addition to trigeminal pathways, sensory afferents from the facial nerve project to the NTS, which also influences the activity of neurons in the RF and LC. The NTS also influences the activity of the dorsal motor nucleus (DMN) of the vagus, which sends preganglionic parasympathetic fibers to various target organs to regulate physiological homeostasis. Afferent projections from cervical spinal pathways provide another pathway by which TEN could modulate the LC . At a bare minimum, the afferent modulation of LC activity alone would alter the mobilization and release of NE to mediate the brain’s response to environmental threats and stress . In fact, it has been shown that sensory stimulation rapidly increases the firing rates of NE neurons in the LC [44, 45]. In turn, the modulation of NE signaling would directly influence sympathoadrenal medullary (SAM) axis activity and regulate the body’s acute response to stress. What lines of evidence support the ability of TEN to act via this mechanistic pathway? The LC exhibits two essential types of neural discharges (tonic and phasic) that modulate cognition and behavior. These phasic and tonic LC discharge patterns favor different modes of signal processing and behaviors in a manner dependent upon the level of afferent drive [19, 46, 47]. In response to sensory stimuli and environmental cues, neurons in the LC have been shown to undergo shifts from tonic to phasic firing . Endogenously, the magnitude of phasic LC activity depends on the level of tonic LC activity (Figure 7A). During stress tonic activity is high and phasic activity is diminished (Figure 7A) [47, 49, 50]. Likewise when tonic activity is extremely low, such as during slow wave sleep, phasic activity is also diminished [47, 49, 50]. In fact it has recently been demonstrated using optogenetic control of mouse LC neurons in vivo that tonic and phasic activity produces robust changes in sleep/wake cycles, motor behaviors, and general arousal in a frequency-dependent manner . These observations reinforce the notion that appropriate levels of arousal stemming from the balance between tonic and phasic LC/noradrenergic activity are necessary for optimal behavioral flexibility and performance [19, 46, 47]. Based on the transitional behaviors of LC activity discussed above, we hypothesize that through cranial nerve afferent pathways TEN drives LC activity into a sympatholytic phasic firing mode by diminishing high levels of stress-induced tonic activity (Figure 7B). This increase in phasic activity in turn may result in higher levels of α2 adrenoceptor activity as discussed further below. The outcome of these actions would be a net decrease in sympathetic tone similar to the basic observations we made regarding changes in HRV, GSR, and sAA levels in response to acute stress (Figures 4 – 6). Future investigations aimed at neurophysiologically elucidating the transfer function(s) between TEN stimulus parameters and LC tonic/phasic activity will be critical to gaining a complete understanding of how TEN can attenuate stress responses. Additional evidence in the literature however supports our hypothetical framework. A, The figure illustrates a working model of neuronal activity patterns exhibited by the LC under different levels of stress and arousal. 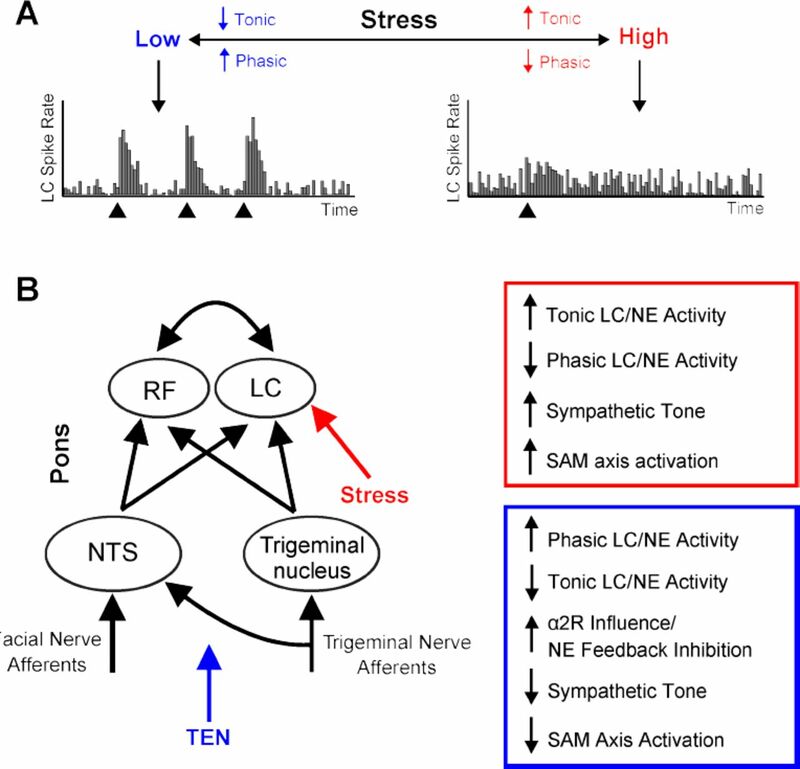 This model incorporates observations that stress leads to high levels of tonic activity in the LC while sensory stimulation (black triangles) triggers phasic activity especially when tonic activity is low [44, 45, 47–50]. B, Facial and trigeminal nerve afferents, as well as the pons portion of the circuit diagram from Figure 1 are shown (left). As illustrated stress (red) acts on LC neurons to increase their tonic firing rates thereby driving sympathetic activity and increasing SAM axis activation. We hypothesize that TEN (blue) biases LC activity through afferent pathways in a manner that increases phasic firing, reduces tonic activity, and suppresses sympathetic tone and SAM axis activation. Our observations suggest this partial mechanism of action, at a first station of information integration in the brain, may involve increased α2 adrenergic activity as depicted. Thirty minutes following the stress trial we observed subjects treated with TEN had significantly lower levels of sAA compared to subjects receiving sham treatment (Figure 6A). This biochemical observation suggests TEN suppressed stress responses by acting partially upon noradrenergic signaling since several studies have shown sAA levels to be predictive of plasma NE concentration [36, 52–54]. For example, stress induced by environmental exposure to extreme cold or heat has been found to increase human sAA levels and plasma NE concentrations without affecting cortisol concentrations . More direct evidence stems from the observation that NE infusions in men caused a significant increase in sAA levels . As observed by Chatterton and colleagues (1996), we found TEN affected sAA levels without influencing cortisol (65). This observation is also consistent with the findings of others reporting that electrical shock used as a stressor influences sAA levels without affecting cortisol levels [33–35]. Changes in sAA levels have also been shown to correlate with changes in HRV. Psychosocial stress in humans has been shown to significantly increase the LF power of HRV spectra and sAA levels without affecting cortisol concentrations . Compared to TEN treated subjects, we found stress caused subjects treated with sham to have significantly greater sAA levels (Figure 6A) and significantly more LF HRV power (Figure 4D). Due to TEN exerting effects on afferent pathways impinging on the brainstem and LC, the HRV and sAA data taken together suggest that subjects treated with TEN protocols had lower plasma NE concentrations following exposure to stress. There are several NE signaling pathways that exert an influence on psychophysiological arousal and stress responses [55–58]. On interesting candidate is the α2 adrenoceptor, which provides negative feedback to NE neurons by hyperpolarizing presynaptic terminals to prevent the further release of NE [59, 60]. The α2 adrenergic receptor agonist clonidine inhibits the tonic activity of neurons without suppressing phasic activity . Our physiological and biochemical data indicate TEN may partially act by producing an increase in α2 adrenergic receptor activity. Clonidine blocks sAA secretion triggered by sympathetic fiber stimulation . Similarly, we observed that TEN significantly attenuated the levels of sAA following stress induction as discussed above (Figure 6). Clonidine also induces sympatholytic (anxiolytic) and sedative effects while stabilizing cardiovascular activity [63–66]. Here clonidine has been shown to exert some of its actions by significantly decreasing LF HRV while affecting the HF component of HRV to a lesser degree in humans . Oral administration of clonidine to healthy subjects has also been shown to significantly reduce the LF component of HRV, as well as lower plasma concentrations of NE [68, 69]. Similar to the actions of clonidine, we found that TEN treatments produced a significant decrease in the LF component of HRV and a large, but marginal decrease in the HF component compared to sham treatments during the stress trial (Figure 4D,E). Also consistent with α2 adrenocepter activation, we found that subjects were significantly more relaxed following TEN treatments compared to sham (Figure 3). Several other observations indicate TEN acts like clonidine to modulate α2 adrenergic receptors. 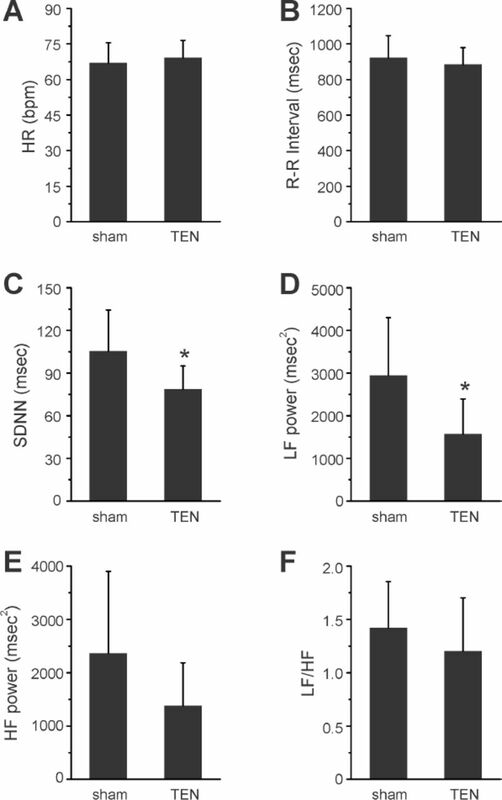 During fear-conditioning we observed subjects treated with TEN had significantly attenuated GSR (electrodermal) responses compared to subjects receiving sham treatments (Figure 5). Clonidine has been shown to inhibit sympathetic-cholinergic activity as indicated by its ability to significantly suppress reflexive and electrically evoked electrodermal activity in cats [70, 71]. Abnormal α2 adrenergic receptor activity has been implicated in several mood and stress disorders. Patients with panic disorder have been shown to possess fewer binding sites for α2 adrenergic receptors compared to normal subjects, exhibit significantly larger skin conductance changes (GSR), and experience larger increases in plasma NE concentration following exposure to stress . In addition to α2 adrenergic receptor signaling pathways, other noradrenergic and neuromodulatory pathways may have also contributed to the effects we observed. For example, the beta-blocker propranolol has been shown to suppress sAA increases due to acute stress . Since the raphe nucleus forms part of the RF, serotoninergic modulation could have mediates some of the effects we observed. In fact, there is evidence suggesting that serotonin may mediate some aspects of stress responses [73, 74], though evidence for a role of serotonin in stress responses has been far more elusive than the effects of NE. Further experiments involving human pharmacology will be required to fully delineate the molecular mechanisms of action underlying the ability of TEN to inhibit stress responses and induce subjective relaxation. These will be important studies given the growing interest in electroceuticals . The influence of other peripheral pathways should also be considered. For example the vagus, the tenth cranial nerve, plays known roles in regulating neurophysiological responses to environmental stimuli and stressors. However vagal afferents do not innervate the cutaneous regions we targeted. Vagal afferents projecting to the NTS carry information from the ear including the external meatus and tympanic membrane, the throat, and thoracic and abdominal viscera from the heart to the distal small intestine . Thus, modulation of regions around the ear might be presumed to exert different outcomes on psychophysiological arousal by recruiting vagal mechanisms and parasympathetic signaling pathways. This seems likely given vagal loops and NTS modulation of the dorsal motor nucleus of the vagus. The DMN sends preganglionic parasympathetic efferent fibers to visceral organs in the thoracic and abdominal cavities to regulate physiological homeostasis, such as gastric motility. Due to their anatomical localization, we do not believe vagal afferents had a primary role in mediating the major effects of TEN on stress responses described above. Admittedly however, it could be difficult to distinguish some noradrenergic responses from vagal parasympathetic ones. This is especially true since TEN could have affected NTS activity through facial nerve pathways, which in turn would influence the DMN (Figure 1). In any case our observations provide clear evidence that TEN can alter the balance of sympathetic and parasympathetic activity, as exhibited by its ability to exert a braking action on acute stress responses. The safety of TEN is supported by a long history of peripheral electrical neurostimulation obtained over more than four decades. Legally marketed electrical nerve stimulation devices are already commercially available and have output levels far greater than the ones implemented here. These devices intended for over-the-counter cosmetic applications of transcutaneous electrical nerve stimulation (TENS) target similar anatomical regions. One example device is the Bio-medical Research (BMR) Face device, which is an over-the-counter TENS device designed to target the trigeminal nerve and provide neuromuscular electrical stimulation (NMES) to encourage facial rejuvenation for aesthetic purposes. A recent study examined the safety and efficacy of this device at a peak current intensity of 35 mA when used five days per week for 20 minutes each day for 12 weeks . There were 56 subjects in the active treatment group and 52 in the placebo sham-control group. There were no significant adverse events in this study and the only reported side effects were minor skin redness following stimulation, which disappeared with 10-20 minutes following use . Consistent with these results, on an acute level we found that TEN did not elicit any significant side effects (Table 2). Further, TEN did not have any significant effect on cognitive performance or reaction times (Table 1). Other observations demonstrating the chronic safety profile of TEN are currently being prepared for publication. Based on all our observations, we conclude TEN provides a safe and reliable approach to modulating psychophysiological arousal. In summary our observations demonstrate that, compared to sham, TEN treatment induces significantly greater relaxation and significantly suppresses physiological and biochemical responses to acute stress. The reduction of LF HRV, decreased levels of sAA, and suppressed GSR in response to acute stress are consistent with the hypothesis that TEN modulation of trigeminal (V1/V2) and cervical spinal (C1/C2) afferent pathways act partially through bottom-up mechanisms by modulating noradrenergic activity in a first station of information processing in the human brain. While further experiments including pharmacological manipulations will be required to test this hypothesis and to investigate the influence of TEN on signaling cascades downstream of NE, our observations have profound implications for stress management and brain health. Further, the capability of being able to rapidly modulate noradrenergic activity by stimulating the human locus coeruleus is a powerful research probe and can uniquely provide lifestyle approaches to minimizing the impact of acute stress in a chemical-free manner. We thank Isy Goldwasser for insightful comments and critical feedback throughout our R&D efforts and in preparing this manuscript. We thank Wing Law, Ph.D., Jay Hamlin and Anil Thakur for their technical support in making this study possible. We are grateful to all the members of the Thync team for immense support and assistance throughout various aspects of platform development, device engineering, and system implementation. WJT, JDC, DZW, and SKP are inventors and co-inventors on issued and pending patents related to methods, systems, and devices for noinvasive neuromodulation. All authors are shareholding employees of Thync, Inc.
McEwen, B.S. and P.J. Gianaros, Central role of the brain in stress and adaptation: links to socioeconomic status, health, and disease. Ann N Y Acad Sci, 2010. 1186: p. 190–222. Kalia, M., Assessing the economic impact of stress--the modern day hidden epidemic. Metabolism, 2002. 51(6 Suppl 1): p. 49–53. McEwen, B.S. and R.M. Sapolsky, Stress and cognitive function. Curr Opin Neurobiol, 1995. 5(2): p. 205–16. Lupien, S.J., et al., Effects of stress throughout the lifespan on the brain, behaviour and cognition. Nat Rev Neurosci, 2009. 10(6): p. 434–45. Marin, M.F., et al., Chronic stress, cognitive functioning and mental health. Neurobiol Learn Mem, 2011. 96(4): p. 583–95. Ader, R., N. Cohen, and D. Felten, Psychoneuroimmunology: interactions between the nervous system and the immune system. Lancet, 1995. 345(8942): p. 99–103. Khansari, D.N., A.J. Murgo and R.E. Faith, Effects of stress on the immune system. Immunol Today, 1990. 11(5): p. 170–5. Padgett, D.A. and R. Glaser, How stress influences the immune response. Trends Immunol, 2003. 24(8): p. 444–8. Steptoe, A. and M. Kivimaki, Stress and cardiovascular disease. Nat Rev Cardiol, 2012. 9(6): p. 360–70. Brotman, D.J., S.H. Golden, and I.S. Wittstein, The cardiovascular toll of stress. Lancet, 2007. 370(9592): p. 1089–100. Southwick, S.M., M. Vythilingam, and D.S. Charney, The psychobiology of depression and resilience to stress: implications for prevention and treatment. Annu Rev Clin Psychol, 2005. 1: p. 255–91. Koelega, H.S., Benzodiazepines and vigilance performance: a review. Psychopharmacology (Berl), 1989. 98(2): p. 145–56. Carmody, J. and R.A. Baer, Relationships between mindfulness practice and levels of mindfulness, medical and psychological symptoms and well-being in a mindfulness-based stress reduction program. J Behav Med, 2008. 31(1): p. 23–33. Scully, D., et al., Physical exercise and psychological well being: a critical review. Br J Sports Med, 1998. 32(2): p. 111–20. Parvizi, J. and A. Damasio, Consciousness and the brainstem. Cognition, 2001. 79(1-2): p. 135–60. Couto, L.B., et al., Descriptive and functional neuroanatomy of locus coeruleus-noradrenaline-containing neurons involvement in bradykinin-induced antinociception on principal sensory trigeminal nucleus. J Chem Neuroanat, 2006. 32(1): p. 28–45. Aston-Jones, G., et al., Afferent regulation of locus coeruleus neurons: anatomy, physiology and pharmacology. Prog Brain Res, 1991. 88: p. 47–75. Aston-Jones, G., J. Rajkowski, and J. Cohen, Role of locus coeruleus in attention and behavioral flexibility. Biol Psychiatry, 1999. 46(9): p. 1309–20. Berridge, C.W. and B.D. Waterhouse, The locus coeruleus-noradrenergic system: modulation of behavioral state and state-dependent cognitive processes. Brain Res Brain Res Rev, 2003. 42(1): p. 33–84. Sara, S.J., The locus coeruleus and noradrenergic modulation of cognition. Nat Rev Neurosci, 2009. 10(3): p. 211–23. Monkhouse, S., Cranial Nerves: Functional Anatomy. 2006, New York: Cambridge University Press. 147. Rea, P., Clinical Anatomy of the Cranial Nerves. 2014, London: Academic Press, Elsevier Inc.
Cook, I.A., et al., Trigeminal nerve stimulation in major depressive disorder: acute outcomes in an open pilot study. Epilepsy Behav, 2013. 28(2): p. 221–6. DeGiorgio, C.M., et al., Trigeminal nerve stimulation for epilepsy: long-term feasibility and efficacy. Neurology, 2009. 72(10): p. 936–8. DeGiorgio, C.M., et al., Randomized controlled trial of trigeminal nerve stimulation for drug-resistant epilepsy. Neurology, 2013. 80(9): p. 786–91. Rodrigues, S.M., J.E. LeDoux, and R.M. Sapolsky, The influence of stress hormones on fear circuitry. Annu Rev Neurosci, 2009. 32: p. 289–313. Ulrich-Lai, Y.M. and J.P. Herman, Neural regulation of endocrine and autonomic stress responses. Nat Rev Neurosci, 2009. 10(6): p. 397–409. Renaud, P. and J.P. Blondin, The stress of Stroop performance: physiological and emotional responses to color-word interference, task pacing, and pacing speed. Int J Psychophysiol, 1997. 27(2): p. 87–97. Thackray, R. and K. Jones, Level of arousal during Stroop performance: Effects of speed stress and “distraction”;. Psychonomic Science, 1969. 17(5): p. 133–135. Granger, D.A., et al., Salivary alpha-amylase in biobehavioral research: recent developments and applications. Ann N Y Acad Sci, 2007. 1098: p. 122–44. Rohleder, N., et al., Psychosocial stress-induced activation of salivary alpha-amylase: an indicator of sympathetic activity? Ann N Y Acad Sci, 2004. 1032: p. 258–63. van Stegeren, A., et al., Salivary alpha amylase as marker for adrenergic activity during stress: effect of betablockade. Psychoneuroendocrinology, 2006. 31(1): p. 137–41. Buchanan, T.W., D. Bibas, and R. Adolphs, Salivary alpha-amylase levels as a biomarker of experienced fear. Commun Integr Biol, 2010. 3(6): p. 525–7. Tamura, A., et al., Salivary alpha-amylase and cortisol responsiveness following electrical stimulation stress in patients with the generalized type of social anxiety disorder. Pharmacopsychiatry, 2013. 46(7): p. 225–60. Tanaka, Y., et al., Salivary alpha-amylase and cortisol responsiveness following electrically stimulated physical stress in bipolar disorder patients. Neuropsychiatr Dis Treat, 2013. 8: p. 1899–905. Thoma, M.V., et al., Acute stress responses in salivary alpha-amylase predict increases of plasma norepinephrine. Biol Psychol, 2012. 91(3): p. 342–8. Reyes del Paso, G.A., et al., The utility of low frequency heart rate variability as an index of sympathetic cardiac tone: a review with emphasis on a reanalysis of previous studies. Psychophysiology, 2013. 50(5): p. 477–87. Billman, G.E., Heart rate variability - a historical perspective. Front Physiol, 2011. 2: p. 86. Vetrugno, R., et al., Sympathetic skin response: basic mechanisms and clinical applications. Clin Auton Res, 2003. 13(4): p. 256–70. Van Buyten, J.P., et al., High-frequency spinal cord stimulation for the treatment of chronic back pain patients: results of a prospective multicenter European clinical study. Neuromodulation, 2013. 16(1): pp. 59–65; discussion 65-6. Kilgore, K.L. and N. Bhadra, Nerve conduction block utilising high-frequency alternating current. Med Biol Eng Comput, 2004. 42(3): p. 394–406. Katz, B., Nerve excitation by high-frequency alternating current. J Physiol, 1939. 96(2): p. 202–24. Svensson, T.H., Peripheral, autonomic regulation of locus coeruleus noradrenergic neurons in brain: putative implications for psychiatry and psychopharmacology. Psychopharmacology (Berl), 1987. 92(1): p. 1–7. Foote, S.L., G. Aston-Jones, and F.E. Bloom, Impulse activity of locus coeruleus neurons in awake rats and monkeys is a function of sensory stimulation and arousal. Proc Natl Acad Sci U S A, 1980. 77(5): p. 3033–7. Aston-Jones, G. and F.E. Bloom, Norepinephrine-containing locus coeruleus neurons in behaving rats exhibit pronounced responses to non-noxious environmental stimuli. J Neurosci, 1981. 1(8): p. 887–900. Aston-Jones, G. and J.D. Cohen, Adaptive gain and the role of the locus coeruleus-norepinephrine system in optimal performance. J Comp Neurol, 2005. 493(1): p. 99–110. Valentino, R.J. and E. Van Bockstaele, Convergent regulation of locus coeruleus activity as an adaptive response to stress. Eur J Pharmacol, 2008. 583(2-3): p. 194–203. Rajkowski, J., P. Kubiak, and G. Aston-Jones, Locus coeruleus activity in monkey: phasic and tonic changes are associated with altered vigilance. Brain Res Bull, 1994. 35(5-6): p. 607–16. Aston-Jones, G., J. Rajkowski, and J. Cohen, Locus coeruleus and regulation of behavioral flexibility and attention. Prog Brain Res, 2000. 126: p. 165–82. Usher, M., et al., The role of locus coeruleus in the regulation of cognitive performance. Science, 1999. 283(5401): p. 549–54. Carter, M.E., et al., Tuning arousal with optogenetic modulation of locus coeruleus neurons. Nat Neurosci, 2010. 13(12): p. 1526–33. Chatterton, R.T., Jr.., et al., Salivary alpha-amylase as a measure of endogenous adrenergic activity. Clin Physiol, 1996. 16(4): p. 433–48. 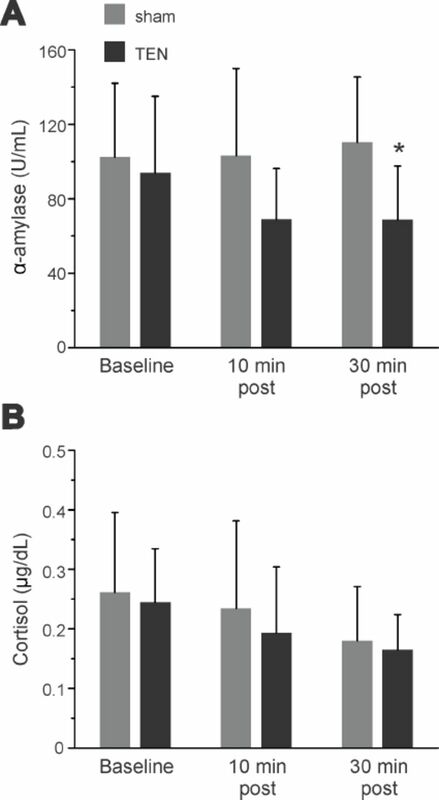 Kuebler, U., et al., Norepinephrine infusion with and without alpha-adrenergic blockade by phentolamine increases salivary alpha amylase in healthy men. Psychoneuroendocrinology, 2014. 49: p. 290–8. Nater, U.M., et al., Stress-induced changes in human salivary alpha-amylase activity -- associations with adrenergic activity. Psychoneuroendocrinology, 2006. 31(1): p. 49–58. Glavin, G.B., Stress and brain noradrenaline: a review. Neurosci Biobehav Rev, 1985. 9(2): p. 233–43. Stanford, S.C., Central noradrenergic neurones and stress. Pharmacol Ther, 1995. 68(2): p. 297–42. Bremner, J.D., et al., Noradrenergic mechanisms in stress and anxiety: II. Clinical studies. Synapse, 1996. 23(1): p. 39–51. Bremner, J.D., et al., Noradrenergic mechanisms in stress and anxiety: I. Preclinical studies. Synapse, 1996. 23(1): p. 28–38. Egan, T.M., et al., Noradrenaline-mediated synaptic inhibition in rat locus coeruleus neurones. J Physiol, 1983. 345: p. 477–88. Aghajanian, G.K. and C.P. VanderMaelen, alpha 2-adrenoceptor-mediated hyperpolarization of locus coeruleus neurons: intracellular studies in vivo. Science, 1982. 215(4538): p. 1394–6. Saunier, C.F., et al., Activation of brain noradrenergic neurons during recovery from halothane anesthesia. Persistence of phasic activation after clonidine. Anesthesiology, 1993. 79(5): p. 1072–82. Gjörstrup, P., Effects of some α-adrenoceptor stimulating and blocking agents on the salivary amylase secretion in the rabbit. Acta Physiologica Scandinavica, 1984. 120(4): p. 567–577. Hou, R.H., et al., Does modafinil activate the locus coeruleus in man? Comparison of modafinil and clonidine on arousal and autonomic functions in human volunteers. Psychopharmacology (Berl), 2005. 181(3): p. 537–49. Fehr, S.B., et al., Clonidine decreases propofol requirements during anaesthesia: effect on bispectral index. Br J Anaesth, 2001. 86(5): p. 627–32. Kamibayashi, T. and M. Maze, Clinical uses of alpha2-adrenergic agonists. Anesthesiology, 2000. 93(5): p. 1345–9. Stuhmeier, K.D., et al., Small, oral dose of clonidine reduces the incidence of intraoperative myocardial ischemia in patients having vascular surgery. Anesthesiology, 1996. 85(4): p. 706–12. Michaloudis, D., et al., The influence of premedication on heart rate variability. Anaesthesia, 1998. 53(5): p. 446–53. Lazzeri, C., et al., Effects of clonidine on power spectral analysis of heart rate variability in mild essential hypertension. J Auton Nerv Syst, 1998. 74(2-3): p. 152–9. Lazzeri, C., et al., Effects of acute clonidine administration on power spectral analysis of heart rate variability in healthy humans. J Auton Pharmacol, 1998. 18(5): p. 307–12. Bernthal, P.J. and M.C. Koss, Effects of clonidine and chlorpromazine on a sympathetic-cholinergic reflex. Eur J Pharmacol, 1979. 60(1): p. 23–9. Walland, A., Clonidine inhibits electrodermal potentials induced by preganglionic stimulation. Eur J Pharmacol, 1984. 102(1): p. 47–53. Braune, S., et al., Psychophysiological and biochemical changes in patients with panic attacks in a defined situational arousal. Eur Arch Psychiatry Clin Neurosci, 1994. 244(2): p. 86–92. Hood, S.D., et al., Serotonin regulation of the human stress response. Psychoneuroendocrinology, 2006. 31(9): p. 1087–97. Chaouloff, F., O. Berton, and P. Mormede, Serotonin and stress. Neuropsychopharmacology, 1999. 21(2 Suppl): p. 28S–32S. Famm, K., et al., Drug discovery: a jump-start for electroceuticals. Nature, 2013. 496(7444): p. 159–61. Randich, A., et al., Responses of celiac and cervical vagal afferents to infusions of lipids in the jejunum or ileum of the rat. Am J Physiol Regul Integr Comp Physiol, 2000. 278(1): p. R34–43. Kavanagh, S., et al., Use of a neuromuscular electrical stimulation device for facial muscle toning: a randomized, controlled trial. Journal of Cosmetic Dermatology, 2012. 11: p. 261–266. Aston-Jones, G. and J.D. Cohen, An integrative theory of locus coeruleus-norepinephrine function: adaptive gain and optimal performance. Annu Rev Neurosci, 2005. 28: p. 403–50.